RocketRAID 600 series HBA's are the ideal 6Gb/s SATA storage solution for any PC or Mac. Available with 1 to 4 Mini-SAS/SATA/eSATA ports in internal and external configurations, RocketRAID 600 series HBA's are capable of supporting point-to-point and Port Multiplier based storage devices. The compact PCB design, available low-profile form factor and industry standard port connectors make any storage upgrade, integration or expansion project a snap. RocketRAID 600 HBA's deliver HighPoint's Industry-proven Hardware Assisted RAID technology, and a comprehensive RAID Management Suite. Customers can quickly and easily configure a wide-range of storage configurations, including RAID 0, 1, 5, 10 and JBOD arrays. HighPoint's 2nd generation RocketRAID 600L series introduce a new Hybrid-Port configuration. 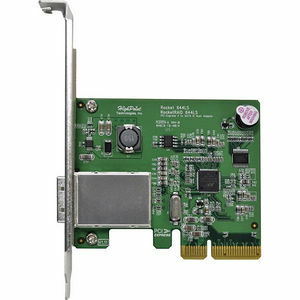 The RocketRAID 642L HBA features both internal and external 6Gb/s SATA ports and is an ideal HBA platform for applications that require built-in storage expansion capabilities. The internal ports provide direct connections for up to 2 SATA hard drives and SSD's, while the external ports are capable of supporting an additional 10 SATA devices when used in conjunction with Port-Multiplier capable storage enclosures.